Home security is no joke. You want to know that your home is safe from intruders and would-be thieves at all times. This can be a tall order, because you may not always be able to control what goes on around your home. What you can control is how much you see of what goes on around your home. According to the US Department of Justice, “Good lighting deters crime and produces a more secure atmosphere.” Who knew that something as simple as security lighting could help keep your home that much safer? Illusion – Even if you’re not home, having security lights will give the illusion that you are watching over your property, especially if you have motion sensor lights. Being in a neighborhood makes these lights even more effective. Your neighbor can always let you know later if they see your motion sensor lights come on – or you can request that they call if you they see someone outside your house who doesn’t belong there. Knowing that people can be seen even when you’re not home should give you peace of mind. Attraction – No, we don’t mean attraction for thieves and intruders, but if you’re going to have security lights, you can use them to improve your home’s curb appeal. Having lights that beautify your home but still give it some extra security will mean that your money is doing double duty. You won’t feel like you’re living in an institutional setting, but you’ll also be able to feel safe and secure in your own home. 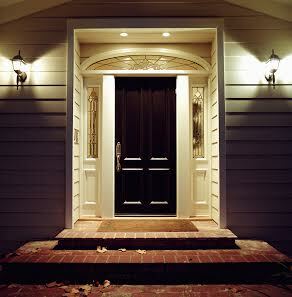 Save money – If you choose to go the route of motion sensor security lighting, you’ll actually be saving yourself money. Running lights all night long can get expensive, but motion sensor security lights only come on when you need them. You’ll also help keep your property free of animals. Most animals flee when they see lights turn on out of a preservation instinct for themselves. If a deer, rabbit, or fox activates your motion sensor lights, they’ll probably scurry off quickly afterwards. Security lighting can prevent the need for fencing to keep these animals out. Security lighting doesn’t have to be expensive or complicated. We can help you figure out what type of outdoor lighting is right for you and your home and help you sleep better at night knowing that your outdoor lighting will deter criminals and help keep your home safe and secure! To talk to someone about outdoor lighting solutions and security, in Baltimore, Maryland or the surrounding areas, call Aqua-Bright today at 410-489-9009 or take a tour through our website. This entry was posted on Friday, August 1st, 2014	at 1:52 pm	. You can follow any responses to this entry through the RSS 2.0	feed. Both comments and pings are currently closed.